Through her professional and volunteer experience, as well as active academic participation in Periodontal and Dental Implant research, Dr. Rosemary Wu is one of the most highly-skilled and well-informed Periodontists in the Greater Sacramento area. Having provided dental implant and periodontal therapy since 2003, Dr. Wu is trained in all of the treatment options LANAP, LAPIP and Pinhole Surgical Technique and latest techniques to combat periodontal infections, enhance aesthetic desires, and reconstruct missing teeth with dental implants. She has unique insight into the relationship between periodontal health and systemic diseases, and her goal is to address each individual's needs by providing periodontal therapy that enhances both their dental and overall health. She is involved with the American Academy of Periodontology, California Society of Periodontics, Sacramento District Dental Society, American Dental Association, California Dental Association and American Association of Women Dentists. Dr. Wu also volunteers her skills and experience with the underprivileged in the Sacramento area, as well as participating in volunteer dental and medical missions to Central America. 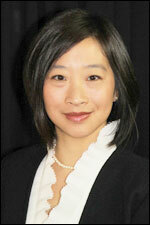 In her free time, Dr. Wu enjoys playing tennis, bike riding, and skiing.